Great performance, not much more to say lol. Red heat sinks, 3000mhz, 16GB - Not Much to say about this really. Works exactly as intended. I will say the red color looks MUCH BETTER in person than ANY of the photos of the product do on retailer websites. Good CAS lat for what its worth this will help more with some rendering and AutoCad, BikeCAD projects. Got these low-profile because I thought I'd need the space. Turns out I didn't but... RAM is RAM, nothing really to see here. Offered at Newegg for a great price of $103.53US delivered, this DDR4-3000 was cheaper than its -2400 cousin. The low profile works well in this mini-ITX build. I was going to go with 32 Gb and been done with it, but got talked out of it by forum posters and the low price of these two sticks. Gaming at maximum settings I've not seen more than 8.6 Gb in use at any one time so far, so 16Gb appears to be plenty as of March 2017. Low profile heat sinks only add about 1/8" to the height and the Cooler Master 212 CPU fan easily clears them. 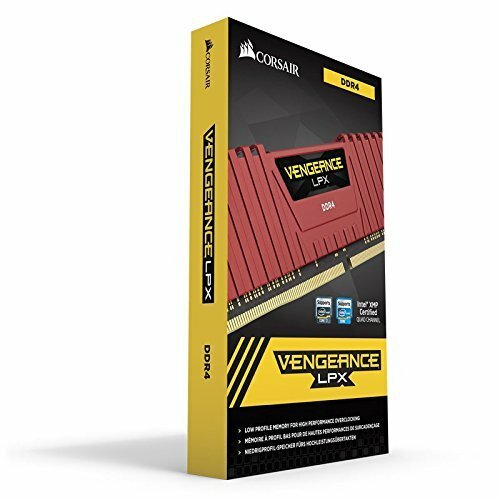 MEMORY:Corsair Vengeance LPX 16GB DDR4 3000. Wanted low profile sticks, and this set was on sale! Ram does what Ram does. It's perfect.